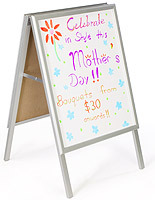 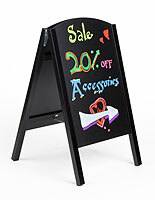 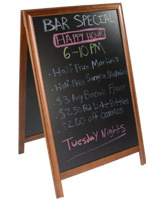 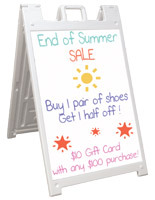 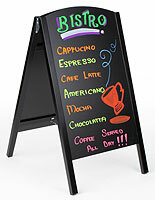 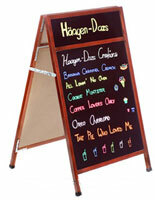 A sidewalk marker board is an ideal solution for advertising both indoors and outdoors. 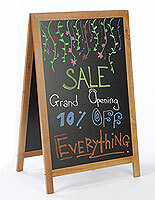 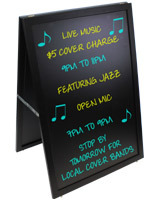 Restaurants, bars, and stores use write-on signage like this to promote events, daily specials, sales information and more. 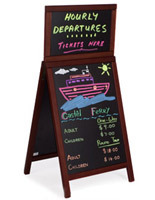 These wet and dry marker boards offer a variety of finishes, and some included color sticks. 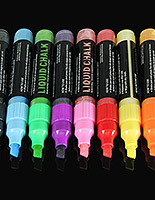 Modern chalk and chalk pens are formulated to only require an eraser to remove lettering. 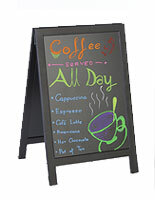 Wet erase pens are water based and feature a brighter appearance. 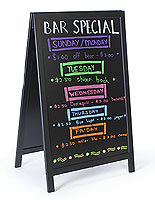 Often called “neon chalk sticks,” these writing tools are available in an assortment of colors and only require a damp towel to remove. 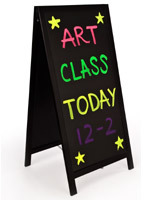 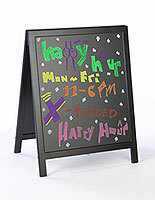 A sidewalk marker board, or pavement display, is a great solution for business owners who want to create an attractive and artistic display to draw in customers. 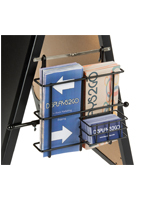 In addition to showcasing custom messages, each promotional message stand features a sturdy and portable frame for added convenience. 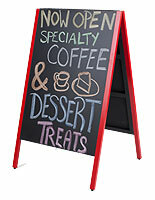 Sidewalk marker boards are offered in a variety of folding, wheeled, and fixed designs and styles for use in any environment. 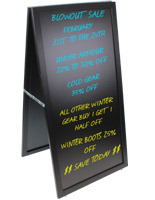 What options are available for displaying hand-written signs for retail advertising? 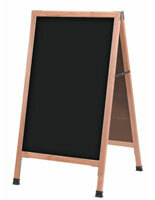 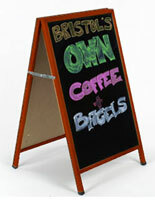 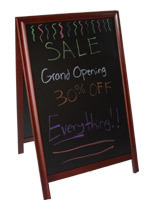 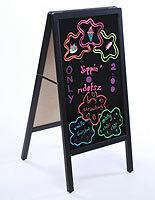 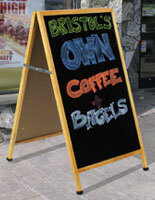 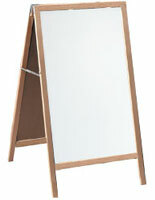 Sidewalk marker boards are available with a classic A-frame layout that folds for transportation and storage. 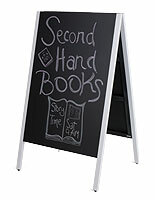 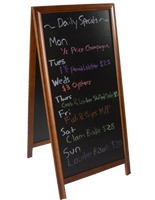 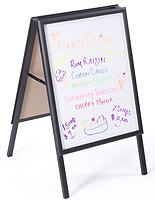 Each stand is made for dry erase or liquid chalk pens and features either a white or black writing surface. 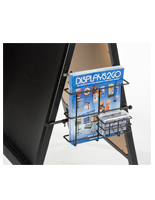 Some models include an additional header area and a clear protective lens for protecting print in inclement weather conditions. 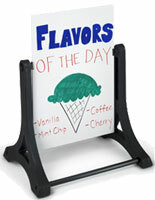 Each A-frame is available with a durable wood or metal fabrication in many finishes. 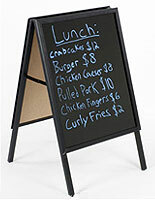 Water-base hand-written signs are a wind-resistant alternative that use springs to remain stable. 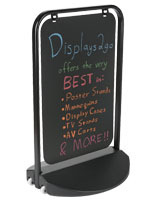 Each weighted display is made of durable aluminum and plastic and offers a removable write-on panel. 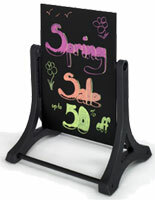 When filled with water or sand, the stand’s base remains steady in high winds. 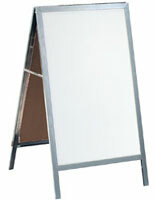 Additionally, some marker boards include a protective plastic cover for guarding messaging against rain and snow. 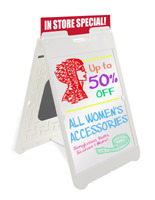 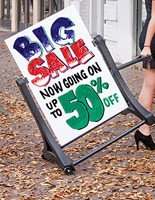 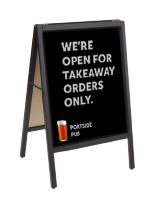 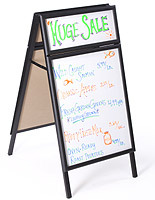 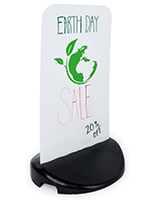 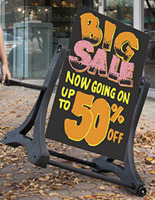 Plastic swinging dry erase sandwich board signs sway in breezy conditions and are also available with a fillable technopolymer base for extra stability. 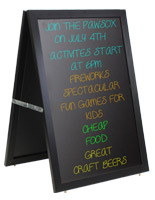 Swingers are double sided, with black finish framing to contrast bright messaging. 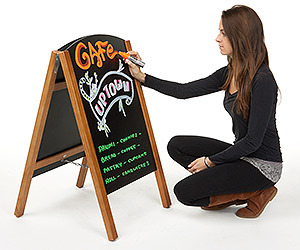 For added convenience, some boards offer wheels and a handle for stress-free mobility. 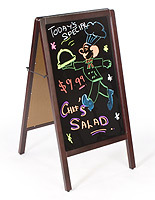 While custom outdoor a frame displays are made for use in outdoor conditions, they can also be used indoors. 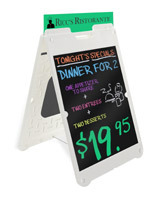 A wet erase A-frame makes a great changeable display for restaurants, offices, service organizations and other venues that can benefit from personalized messaging. 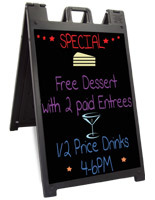 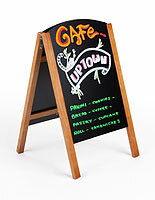 A hand-written sign can update employees or passersby on menu items, special offers and upcoming events. 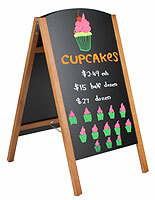 Artistic users can create a striking illustration that grabs the attention of potential customers. 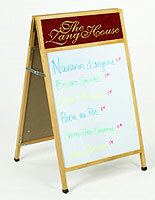 We also offer compatible writing pens in various colors and tip sizes for both wet and dry erase signs. 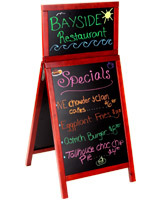 Order a pavement displays today and get fast same day shipping on the fixtures themselves, inserts, liquid chalk, accessories and more.